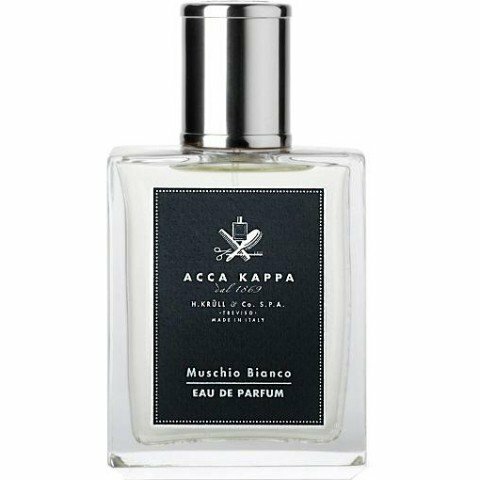 Muschio Bianco is a popular perfume by Acca Kappa for women and men and was released in 2012. The scent is fresh-woody. It is still in production. First of all, I got to know and appreciate this wonderful fragrance through Parfumo. First of all a big thank you. The family-run company Acca Kappa from Italy is generally very sympathetic to me. Basically yes a brush manufacturer with long tradition sometime also the production of smells, soaps etc. took place. After own research, probably very much attention is paid to natural ingredients and any kind of animal experiments is rejected. I think it's very sympathetic. Sooner or later I will test the other fragrances of this house as well. Now it's all about "Muschio Bianco/ White Moss" today, especially the Eau de Parfum version. Compared to the Eau de Cologne, this is somewhat deeper and mossier. A glance into the fragrance pyramid reveals that moss is even listed in the Eau de Parfum, but not in Cologne. I like it very much, because it makes the scent a little bit greener. All this makes this fragrance so incredibly beautiful, if...well, if it weren't for this weak shelf life or Sillage. Basically the drydown described by me is often even durable for one day on the clothes (even if only very weakly), on the skin, at least on mine however no chance. In addition, it is very close to the body, which can be nice in certain moments. Muschio Bianco was an absolute spontaneous purchase - when I ordered another fragrance, I stumbled across a special offer and remembered that he was on my watch list. After a short review of the enthusiastic comments, the fragrance ended up in my shopping basket. Muschio Bianco doesn't let me break out into raptures like others here on the site and there's a reason for that. In my perfume cupboard there is a copy of L'eau Serge Lutens - and Muschio Bianco reminds me of that very much. Where "L'eau" is more citric, "Muschio" is a little greener and spicier (and somehow warmer). Muschio also starts lemony, but then quickly becomes green-spicy: you can smell the cardamom clearly, in addition it smells indefinably of green kitchen herbs (rather in the direction of wild spices, could be the juniper). "L'eau Serge Lutens", on the other hand, remains citrusy, minty and fresh all the time. Both are absolute detergent clean fragrances, which are very similar in base. But I like Serge Lutens one tick better, also because he is clearly in the lead when it comes to durability. Conclusion on "Muschio Bianco": certainly not a bad buy, but for me not a post-purchase candidate. Lovers of Muschio Bianco who have nothing against citrus and mint and are after something comparable with longer shelf life, but L'eau Serge Lutens is recommended for a test! Write the first Review for Muschio Bianco / White Moss (Eau de Parfum)!